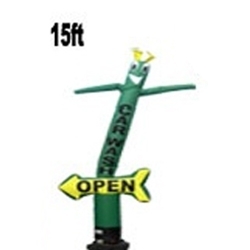 This vibrant Arrow Air Dancer is sure to attract customers into your lot. Visible from miles away, it is perfect for weekend sales, special promotions, or any event! It is made of innovatitive polyflate material, much better than the ripstop material used by most dealers. These air dancers dance better than any other unit available. **Point your customer in the right direction! Put your message on the air dancer and on the arrow. Our design team will send you a proof. You will be allowed to make change after you receive the proof. Please explain what you would like you Arrow Air Dancer to look like in the box bellow.